Chris Amon was back for 1969 and taking it much more seriously with two Ferrari 246T/69s for himself and teammate Derek Bell and four 300 bhp 24-valve engines. Despite the loss of Jim Clark, Lotus were present with a two-car team of Lotus 49Bs for Graham Hill and new teammate Jochen Rindt. 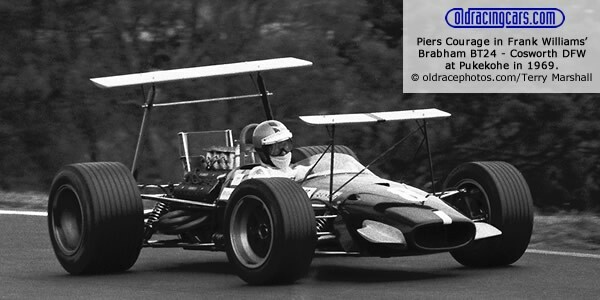 BRM did not enter so the only other overseas entry was Frank Williams who had a Brabham BT24 for Piers Courage. Rindt proved to be Amon's closest rival but spun away the lead at both Pukekohe and Levin, leaving Amon to win both races, before the Austrian took a comfortabe win at Wigram. A dominant victory at Lakeside's Australian GP for Amon meant Rindt could no longer catch him and when Amon and Courage tangled at Warwick Farm, the Kiwi was champion. He rounded off the season with victory at Sandown, his sixth in two seasons. Now that the visiting British teams were using F1 cars and then taking them home, there was no longer the annual influx of new machinery for the locals. Alec Mildren had the funding necessary to commission specials but the number of competitive 2.5-litre cars was definitely dropping. Dave McKay's Scudria Veloce was the nominal entrant of Amon's Ferraris but no longer ran their own car. This season, Mildren had installed his Alfa V8 in a car designed for him by Len Bailey and constructed by Alan Mann Racing in England. 09 Feb 1969 > Warwick Farm "100"
The Australian and New Zealand authorities argued over the need for a change from the 2.5-litre Formula and eventually settled on a move to Formula 5000, now flourishing in the US and in Britain. So this would be the last 2.5-litre Formula Tasman Cup and the last time the F1 teams would participate. A new and equally memorable phase was about to begin.